Snap-on Smile is a patented, revolutionary dental appliance that requires no drilling, no injections, and no adhesives. It snaps right over your natural teeth. Snap-On Smile is easily removable, completely reversible and is an excellent option for patients looking for a non-invasive, affordable approach to restorative and cosmetic dentistry. You can even eat while wearing the Snap-On Smile appliance without it coming loose or shifting. Snap-On Smile is comfortable. It does not impinge on the gum tissue nor cover the palate, as its retention is completely tooth-borne. 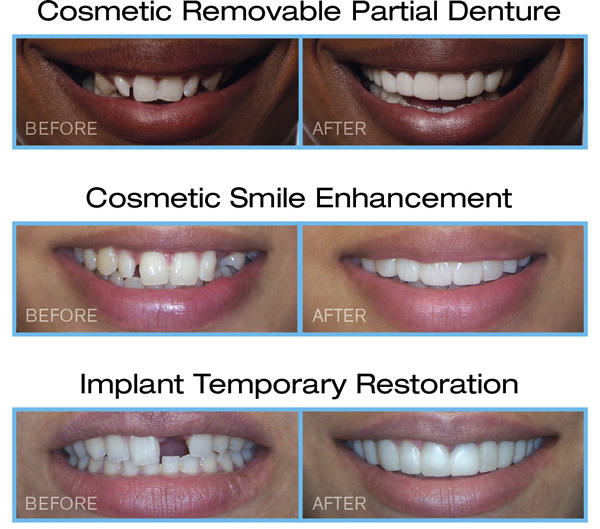 Snap-On Smile is non-invasive and easily removable, making it completely reversible. Its patented design is flexible, incredibly strong, and functional. Plus, its virtually stain resistant, giving you a confident smile. Snap-On Smile offers a simple, life-changing solution for many patients of all ages: those with crooked, stained or missing teeth or with wide gaps, patients who are candidates fo rfor implants r bridges, people undergoing full-mouth reconstruction or implant procedures, patients who want to avoid shots and drilling, as well as those who simply want better functioning teeth quickly, or a preview of what dentistry has to offer. Thousands of patients worldwide have already experienced the benefits of Snap-On Smile. Snap-On Smile can be life changing. It gives back the confidence to smile. Remember, you can eat with it, drink with it, and wear it all day every day. (Just remove it when you sleep). Plus, its virtually stain resistant, giving you a confident, attractive smile, hiding any imperfections and even missing teeth! No shots. No drilling. No adhesives. You can even eat while wearing the Snap-On Smile® appliance. Patients looking for a non-invasive, reversible, affordable approach to restorative and cosmetic dentistry are excellent candidates for Snap-On Smile. It’s an easy, quick and affordable solution for patients who want to feel better, look better, and function better. Patients using Snap-On Smile report an immediate boost to confidence and self esteem. Most are impressed with the natural look and feel of Snap-On Smile and are grateful for the brief time investment – about two weeks – to achieve such life changing results. The process is quick and painless. All it takes is a brief consultation with Dr. Mastis to determine if you are a candidate , and whether you wish to have Snap-On Smile for your upper or lower teeth, or both. Dr. Mastis will take photos and impressions of your teeth. You choose from different smile shapes and shades for your Snap-On Smile. In about two weeks, the exclusive lab at Snap-On Smile will create and send Dr. Mastis your new, custom-designed appliance for final insertion. Snap it in and wear it home. Change your smile… change your life. Call now to get your new smile started.